Mother's Day is right around the corner. Can you believe it? I guess all of those adults were right when I was a kid, the years DO go faster and faster when you get older. Tonight is our annual Mother/Son baseball game at our second oldest son's school. We are both very excited to be participating in it again. Since he is in 3rd grade this year, we will only have 2 more years to participate until he goes to middle school. I'll be sad when we can't do it anymore. YES, you saw that correct! I did give a gin cocktail 5 shots out of 5......have you gotten back off of the floor yet? 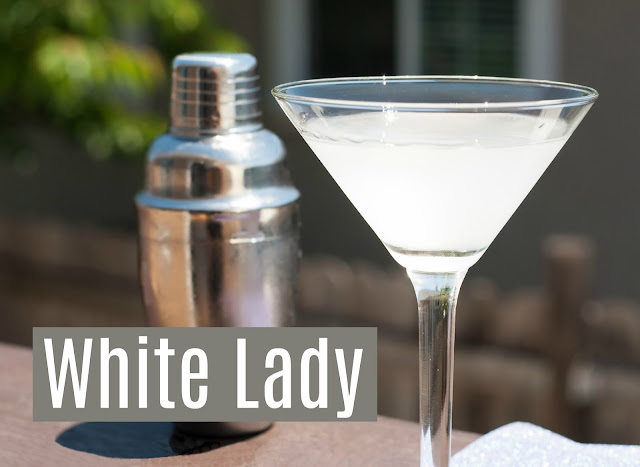 I found the recipe for the White Lady here. This is a simple cocktail to make and it only has three ingredients. I can taste each of the three ingredients and boy are the proportions correct and good! Just for kicks I checked to see what cocktail I made for last years Mother/Son baseball game, it was a Malibu Sunrise which was delicious. On Mother's Day itself I made a Mother Goose which was green and good! I wish all of your Mother's out there a very Happy Mother's Day! In a cocktail shaker, add ice and all of the ingredients above. Shake and strain into a martini glass and enjoy! Here's to all you mom's out there, enjoy your Sunday! Wow, that sounds like a lot of lemon juice. Yay! a gin cocktail you like :) I really like white ladies, too.